GoldMedi is a Creative Responsive Bootstrap 4 landing page template. The template is coming with different attractive unique design variations. Fully responsive design layouts with visitor-centric stunning look and feel will help to reach target audience for the business. 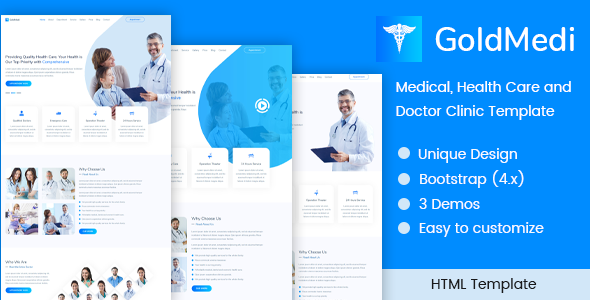 This template is suitable for doctors, surgeons, family doctors, clinic, cosmetic surgery, pediatric clinic, medical practices, dentists, hospitals, health clinics, pediatrics, psychiatrist, psychiatry, chiropractor, veterinary clinics and other medical related practices websites. The template contains easy to read and understand source code which has been written by following Good Programming Practices. Also, this template is easily customizable and the detailed documentation will help to do any customization of the template.